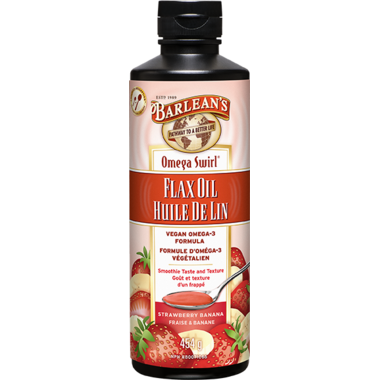 With over 2,900 mg of Omega-3 per serving, Omega Swirl flax oils allow everyone to enjoy the benefits of a delicious, super-efficient dose of Omega-3 nutrition - without any oily texture or large capsules to swallow. Emulsified for superior taste, texture and absorption, it’s the perfect solution for the whole family! Recommend Dosage: 1-2 tbsp daily. Can be taken straight or mixed into juice, yogurt, oatmeal, cottage cheese or blended beverages. Ingredients: Flaxseed oil, water, xylitol, glyserine, gum arabic, natural flavors, vegetable juice, citric acid, xanthan gum, guar gum, sorbic acid and ascorbyl palmitate. Vegan, Dairy Free, Soy Free, Sugar Free, Gluten Free, Non-GMO Keep out of reach of Children.